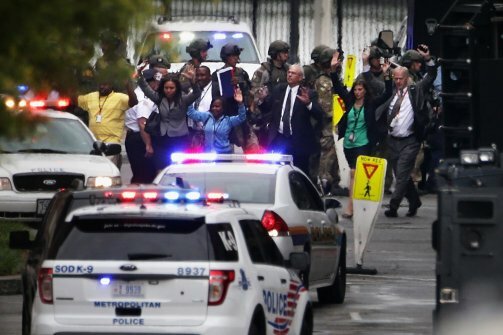 Mark Vandroff, a 46-year-old captain in the Navy who works in Building 197, was in a conference room on the third floor with 8 or 9 others when the shooting started. He says they all ducked down and then saw two bullet holes in the wall about 8 feet above the ground. At around 10 a.m., he was evacuated and went to a secure location where he and others gave witness statements. Vandroff said that he had always thought he had worked in “a secure facility” and noted that members of the NCIS were normally stationed for security in Building 197.